Norwegian Doctor in Gaza - Unbiased? Seems like a non-biased, non-Palestinian, disinterested party to the conflict, no? When asked if Israel was targeting Hamas Dr Gilbert replies that out of the hundreds of injured he has seen only two fighters. The rest are civilians. Of course, let's ignore for a moment that most members of Hamas do not wear a uniform for two reasons: one: fear of being targeted by Israeli snipers and two: if shot, to appear as a civilian casualty. But don't take my word for it, UNRWA, no friend of Israel's, estimates that 25% of the dead have been civilians. Accordingly there should have been hundreds and hundreds of injured Hamas soldiers in the hospital. How did Doctor Gilbert miss them all? Is it even remotely possible that 500 civilians have been injured but only two soldiers? Can any reasonable person believe that? There are no shortage of idiot blogs that carry this story without questioning it, blogs like the Raw Story and the Mosquito Blog. So I have to ask, is it possible Doctor Gilbert is biased? 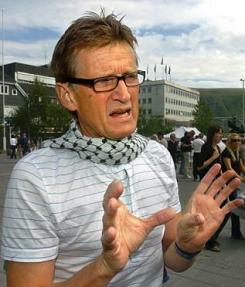 It seems Dr Mads Gilbert is indeed mads. Mad for Palestinians. The doctor has been a solidarity worker for Palestinians since the 1970s, is a politician and member of Rodt (Red Party) which if you don't know is a Norwegian Revolutionary socialist political party and had made a statement to Dagbladet (a Norwegian paper) after the September 11 attacks that he supported terror against the US. Anti-American? No doubt. Anti-Israeli? Obviously. Axe to grind? He's been on the Palestinian side for almost 40 years, what do you think? This guy is not at the hospital to save lies; his only purpose is to wait around for an interview so he can condemn Israel. We can discount the good doctor's version of civilian casualties in Gaza. By the way, Doc, nice kafiyyeh in the photo below. I read on Q & A Islam that the kafiyyeh is traditional, not religious and that wearing the kafiyyeh is similar to an African-American wearing traditional African attire or an Indian wearing a sari. The kafiyyeh shows identity and pride in one's culture. Hmmm. See War in Gaza Update #10.5 at Random Thoughts- Do They Have Meaning? And regarding the UN School bombing see this video and this video.